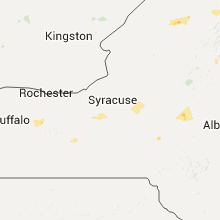 The Elbridge, NY area has had 0 reports of on-the-ground hail by trained spotters, and has been under severe weather warnings 1 time during the past 12 months. 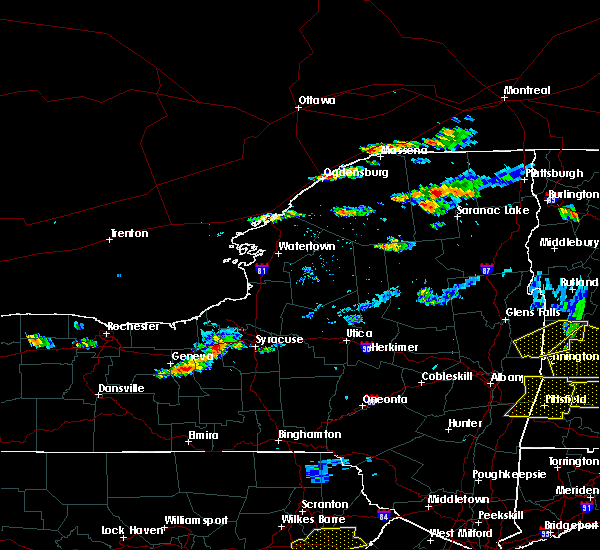 Doppler radar has detected hail at or near Elbridge, NY on 12 occasions. 9/21/2018 7:40 PM EDT At 739 pm edt, severe thunderstorms were located along a line extending from near lehigh vallley junction to near canoga to near dresden to bluff point to near pulteney to near avoca to howard, moving east at 55 mph (radar indicated). Hazards include 60 mph wind gusts. Expect damage to roofs, siding, and trees. severe thunderstorms will be near, seneca falls, romulus and montezuma around 745 pm edt. auburn, sennett and ovid around 750 pm edt. dundee, starkey and fleming around 755 pm edt. hector, owasco and campbell around 800 pm edt. covert, genoa and marcellus around 805 pm edt. watkins glen, locke and moravia around 810 pm edt. 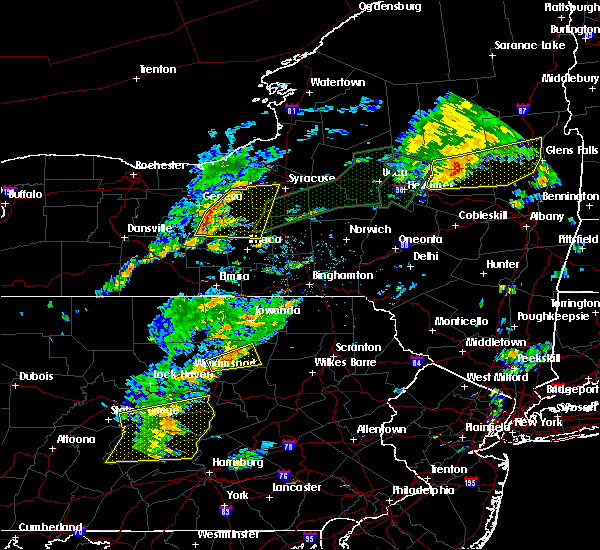 Ithaca, montour falls and odessa around 815 pm edt. 10/15/2017 6:08 PM EDT At 607 pm edt, severe thunderstorms were located along a line extending from 7 miles northwest of redfield to i-81 exit 33 to near phoenix to near camillus to sennett to cayuga, moving east at 45 mph (radar indicated). Hazards include 60 mph wind gusts. Expect damage to trees and power lines. 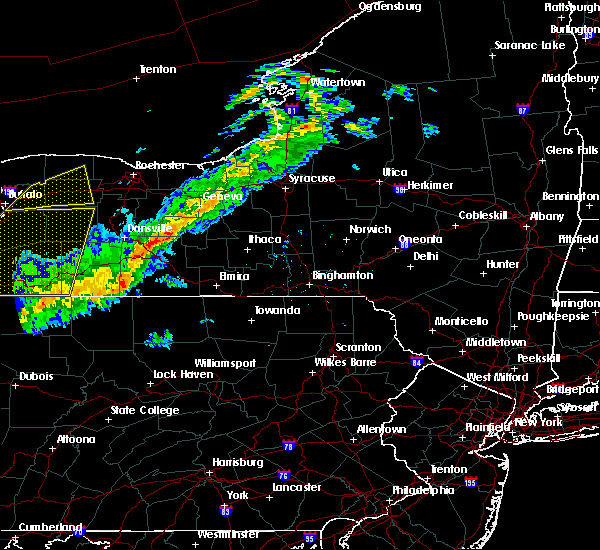 severe thunderstorms will be near, brewerton around 615 pm edt. syracuse, cicero and galeville around 620 pm edt. owasco around 625 pm edt. camden, manlius and niles around 630 pm edt. kirkville around 635 pm edt. 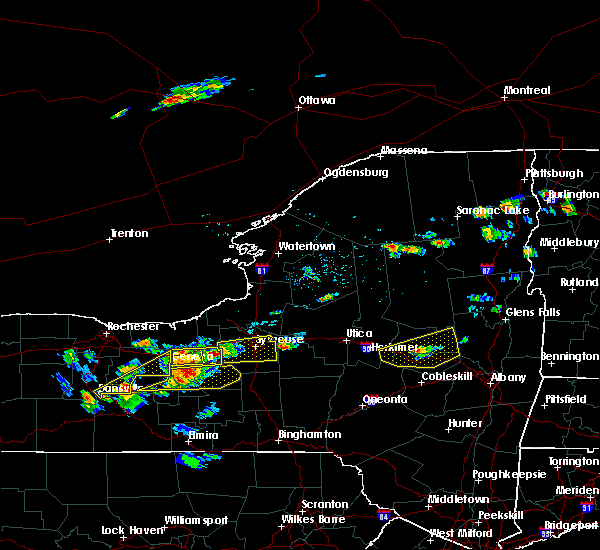 sullivan, chittenango and taberg around 640 pm edt. pompey, vienna and canastota around 645 pm edt. Boonville, lenox and tully around 650 pm edt. 10/15/2017 5:35 PM EDT At 534 pm severe thunderstorms were located along a line extending from 7 miles northeast of lyons to near clyde to new york thruway exit 42, moving east at 60 mph (radar indicated). Hazards include 60 mph wind gusts. Expect damage to trees and power lines. 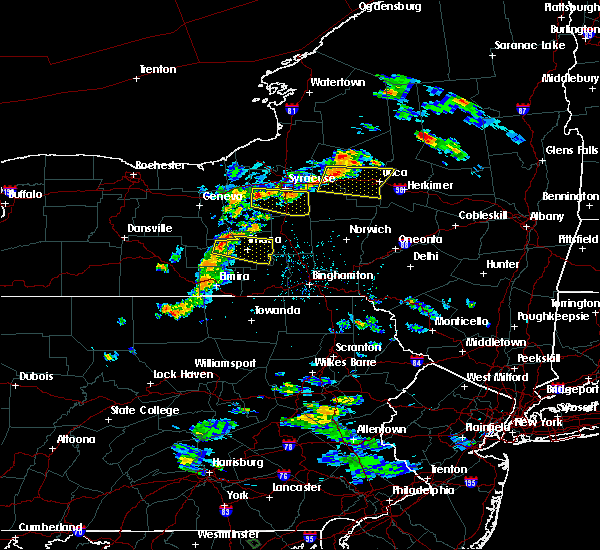 severe thunderstorms will be near, lehigh vly jct around 545 pm edt. montezuma around 550 pm edt. auburn, lysander and throopsville around 555 pm edt. 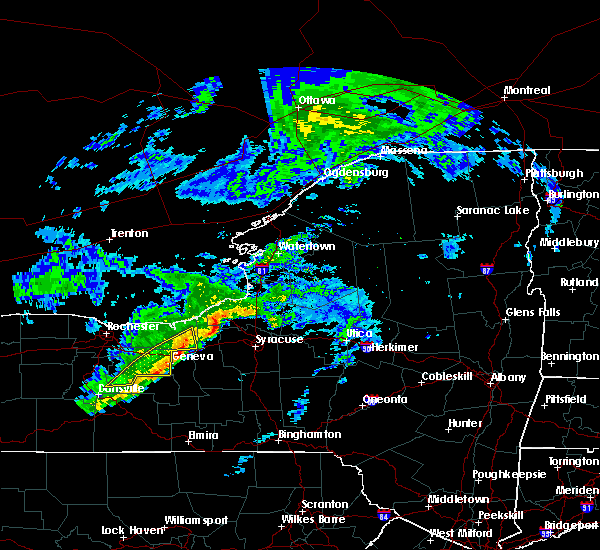 sennett, skaneateles and jordan around 600 pm edt. baldwinsville around 605 pm edt. 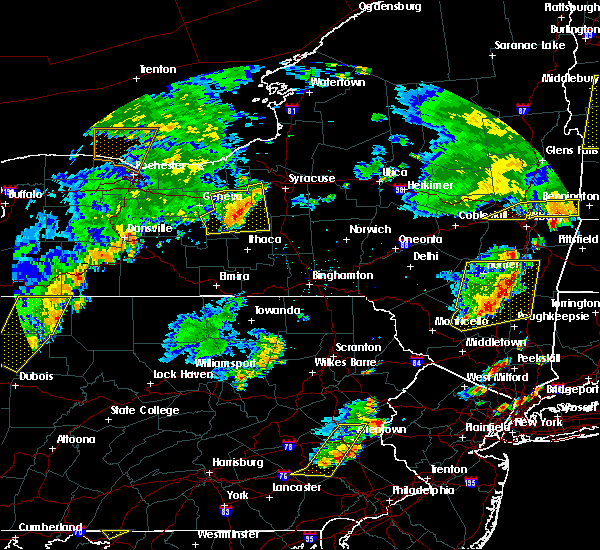 marcellus and camillus around 610 pm edt. 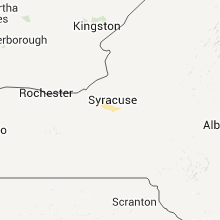 Syracuse, cicero and liverpool around 615 pm edt. 8/22/2017 2:55 PM EDT At 255 pm edt, severe thunderstorms were located along a line extending from phoenix to throopsville, moving east at 50 mph (radar indicated). Hazards include 60 mph wind gusts. Expect damage to trees, and power lines. 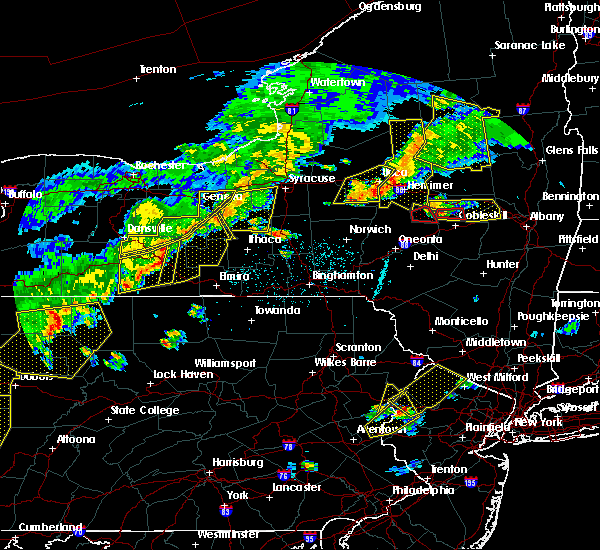 severe thunderstorms will be near, baldwinsville, liverpool and galeville around 300 pm edt. cicero around 305 pm edt. marcellus and bridgeport around 315 pm edt. vienna, sylvan beach and lyndon around 330 pm edt. 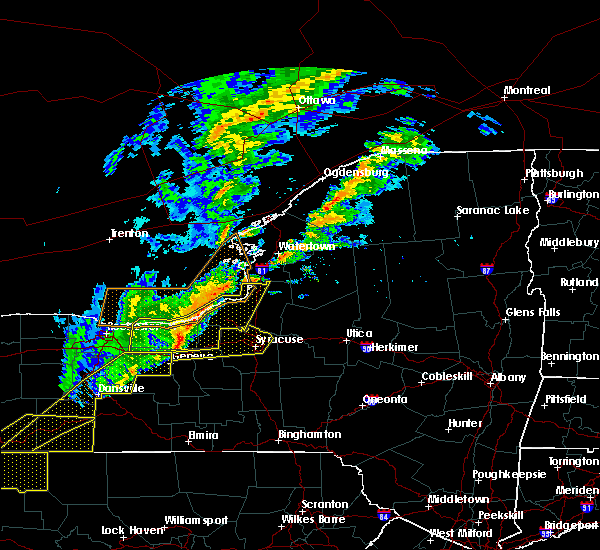 A tornado watch remains in effect until 900 pm edt for central new york. 7/1/2017 1:50 PM EDT At 150 pm edt, a severe thunderstorm was located over kendaia, or 10 miles northeast of penn yan, moving east at 30 mph (radar indicated). Hazards include 60 mph wind gusts. Expect damage to trees, and power lines. this severe thunderstorm will be near, aurora and interlaken around 205 pm edt. levanna, sheldrake and kidders around 210 pm edt. ledyard and king ferry around 215 pm edt. venice center around 220 pm edt. genoa and scipio center around 225 pm edt. cascade and casowasco around 230 pm edt. owasco, locke and moravia around 235 pm edt. Niles and montville around 240 pm edt. 6/18/2017 6:38 PM EDT At 637 pm edt, severe thunderstorms were located along a line extending from 6 miles west of cato to near kendaia, moving east at 35 mph (radar indicated). Hazards include 60 mph wind gusts and quarter size hail. Minor hail damage to vehicles is possible. expect wind to cause damage to trees, and power lines. 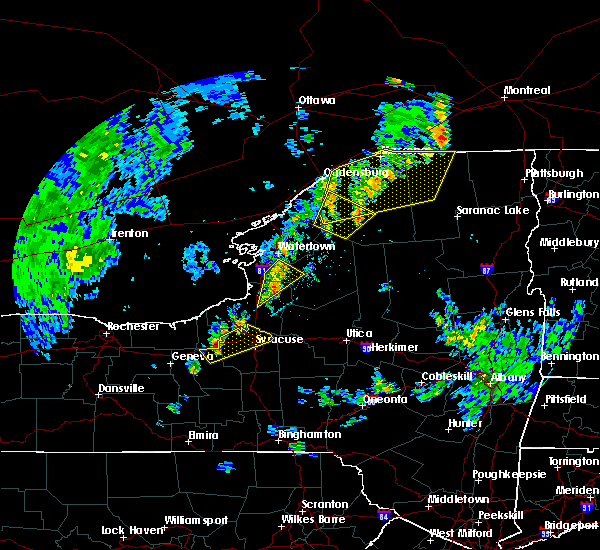 severe thunderstorms will be near, seneca falls around 655 pm edt. lysander, union springs and cayuga around 700 pm edt. baldwinsville around 705 pm edt. auburn, fleming and scipio center around 710 pm edt. melrose park and casowasco around 715 pm edt. owasco and sennett around 720 pm edt. skaneateles, niles and brewerton around 725 pm edt. Marcellus around 730 pm edt. 5/18/2017 4:49 PM EDT At 449 pm edt, a severe thunderstorm was located over sennett, or near auburn, moving east at 35 mph (radar indicated). Hazards include golf ball size hail and 60 mph wind gusts. People and animals outdoors will be injured. expect hail damage to roofs, siding, windows, and vehicles. expect wind damage to roofs, siding, and trees. this severe thunderstorm will be near, jordan around 455 pm edt. skaneateles around 500 pm edt. 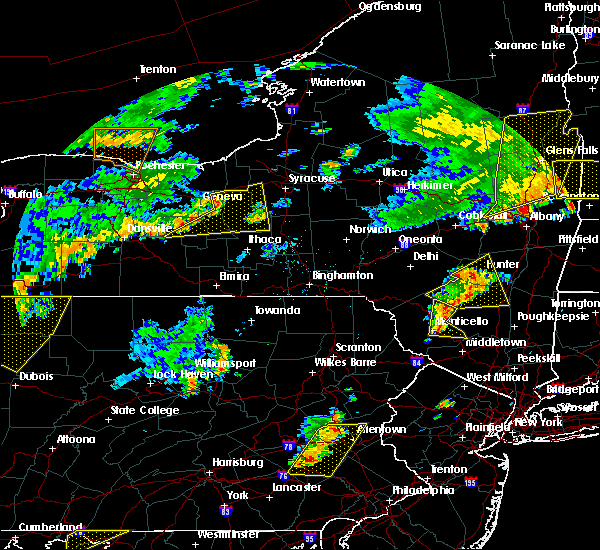 marcellus and camillus around 510 pm edt. liverpool, new york state fairgrounds and galeville around 520 pm edt. syracuse around 525 pm edt. Manlius, lyndon and kirkville around 530 pm edt. 5/1/2017 6:30 PM EDT At 630 pm edt, a severe thunderstorm was located over marcellus, or 11 miles west of syracuse, moving northeast at 50 mph (radar indicated). Hazards include 60 mph wind gusts. Expect damage to roofs, siding, and trees. this severe thunderstorm will be near, liverpool, new york state fairgrounds and galeville around 640 pm edt. syracuse and lyndon around 645 pm edt. cicero and kirkville around 650 pm edt. bridgeport around 655 pm edt. camden, vienna and sylvan beach around 710 pm edt. blossvale, taberg and new london around 715 pm edt. lee around 720 pm edt. rome around 725 pm edt. 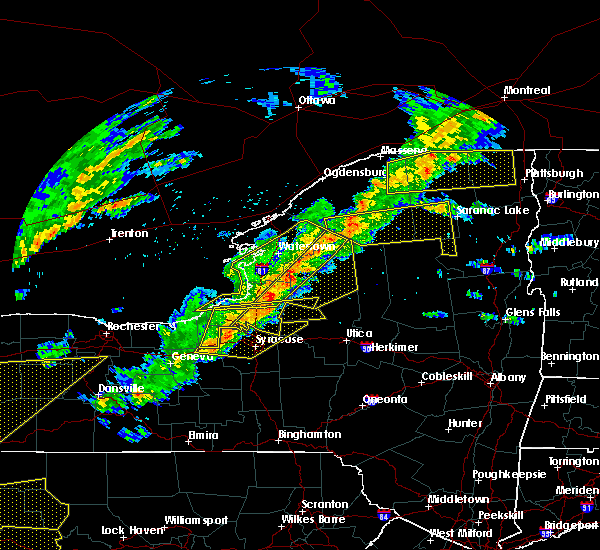 A tornado watch remains in effect until 1000 pm edt for central new york. 9/11/2016 12:21 AM EDT At 1220 am edt, a severe thunderstorm was located near jordan, or 7 miles southwest of baldwinsville, moving northeast at 45 mph (radar indicated). Hazards include 60 mph wind gusts and quarter size hail. Hail damage to vehicles is expected. expect wind damage to roofs, siding, and trees. 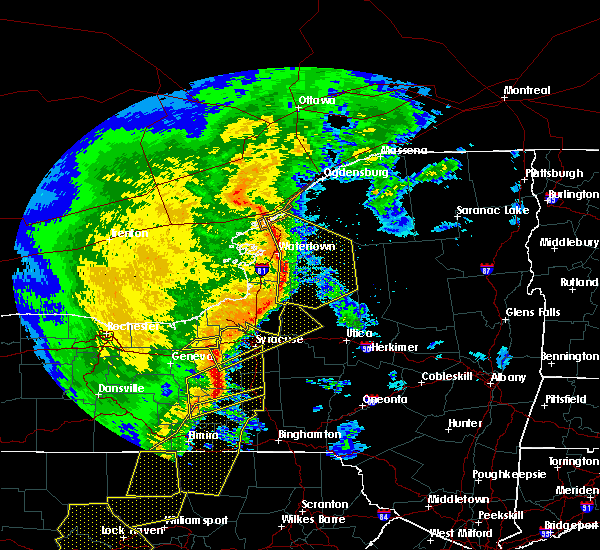 this severe storm will be near, camillus around 1225 am edt. baldwinsville and new york state fairgrounds around 1230 am edt. syracuse, liverpool and galeville around 1235 am edt. cicero and brewerton around 1245 am edt. Bridgeport around 1250 am edt. 9/11/2016 12:09 AM EDT At 1209 am edt, a severe thunderstorm was located over sennett, or near new york thruway exit 40, moving northeast at 45 mph (radar indicated). Hazards include 60 mph wind gusts and quarter size hail. Hail damage to vehicles is expected. expect wind damage to roofs, siding, and trees. this severe thunderstorm will be near, skaneateles and jordan around 1215 am edt. marcellus around 1220 am edt. camillus around 1225 am edt. baldwinsville around 1230 am edt. syracuse, liverpool and galeville around 1235 am edt. cicero and brewerton around 1245 am edt. Bridgeport around 1250 am edt. 8/13/2016 8:10 PM EDT At 809 pm edt, a severe thunderstorm was located near otisco, or 9 miles southwest of syracuse, moving east at 40 mph (radar indicated). Hazards include 60 mph wind gusts. Expect damage to roofs. siding. and trees. This severe thunderstorm will remain over mainly rural areas of central seneca, cayuga and southwestern onondaga counties. 8/13/2016 7:34 PM EDT At 733 pm edt, a severe thunderstorm was located over cayuga, or near seneca falls, moving east at 40 mph (radar indicated). Hazards include 60 mph wind gusts. Expect damage to roofs. siding. and trees. this severe thunderstorm will be near, auburn, fleming and throopsville around 745 pm edt. sennett and melrose park around 750 pm edt. owasco and skaneateles around 755 pm edt. niles around 800 pm edt. Marcellus around 805 pm edt. 7/18/2016 2:05 PM EDT At 205 pm edt, severe thunderstorms were located along a line extending from near plainville to near sennett to auburn, moving east at 45 mph (radar indicated). Hazards include 60 mph wind gusts. Damage to roofs. siding. and trees is possible. 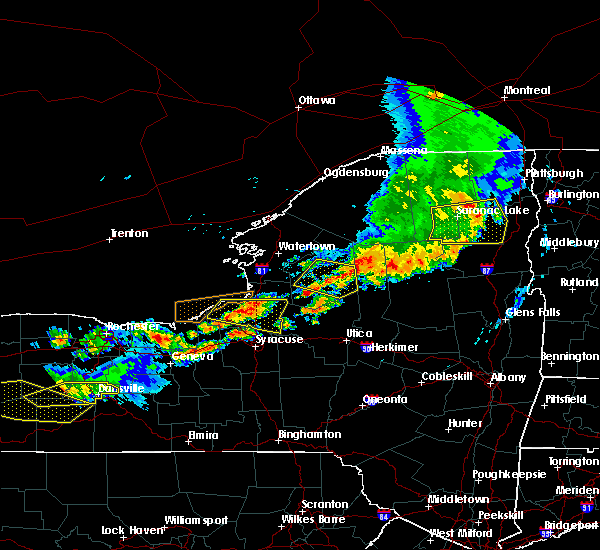 severe thunderstorms will be near, baldwinsville, skaneateles and marcellus around 215 pm edt. camillus around 220 pm edt. liverpool, galeville and new york state fairgrounds around 225 pm edt. Syracuse, cicero and manlius around 230 pm edt. 7/13/2016 6:00 PM EDT At 600 pm edt, a severe thunderstorm was located over otisco, or 12 miles south of syracuse, moving east at 20 mph (radar indicated). Hazards include 60 mph wind gusts and quarter size hail. Hail damage to vehicles is expected. expect wind damage to roofs, siding, and trees. this severe storm will be near, la fayette around 615 pm edt. tully around 620 pm edt. Pompey and fabius around 630 pm edt. 7/13/2016 5:28 PM EDT At 528 pm edt, a severe thunderstorm was located over marcellus, or 10 miles east of auburn, moving east at 25 mph (radar indicated). Hazards include 60 mph wind gusts and quarter size hail. Hail damage to vehicles is expected. expect wind damage to roofs, siding, and trees. this severe thunderstorm will be near, otisco around 555 pm edt. tully and la fayette around 605 pm edt. manlius around 610 pm edt. pompey around 615 pm edt. Fabius and watervale around 620 pm edt. 6/20/2016 11:48 PM EDT At 1147 pm edt, severe thunderstorms were located along a line extending from 8 miles southwest of boonville to near bridgeport to near jordan, moving southeast at 30 mph (radar indicated). Hazards include 60 mph wind gusts and penny size hail. Expect damage to roofs. siding. and trees. these severe storms will be near, boonville around 1155 pm edt. 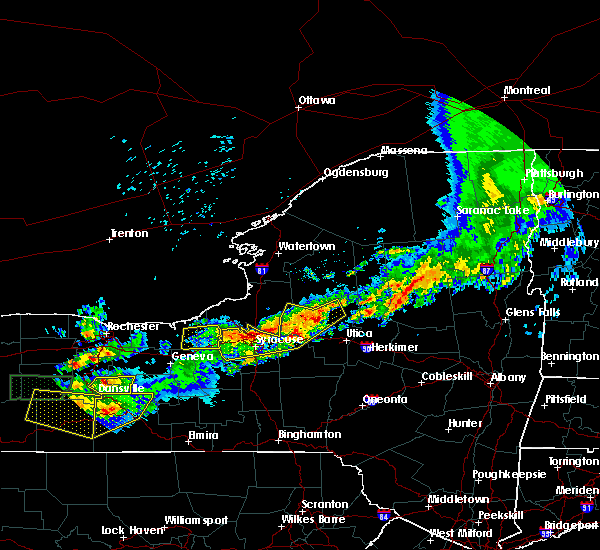 rome, sullivan and chittenango around 1200 am edt. canastota around 1205 am edt. oneida, lenox and wampsville around 1210 am edt. Lyndon around 1215 am edt. 6/20/2016 11:11 PM EDT At 1111 pm edt, severe thunderstorms were located along a line extending from near redfield to near phoenix to near cato, moving southeast at 30 mph (radar indicated). Hazards include 60 mph wind gusts and quarter size hail. Hail damage to vehicles is expected. expect wind damage to roofs, siding, and trees. severe thunderstorms will be near, camden and cicero around 1130 pm edt. 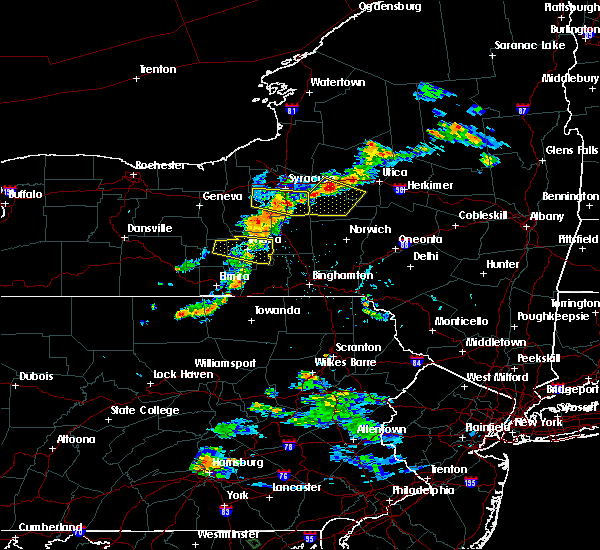 marcellus, camillus and bridgeport around 1140 pm edt. liverpool, new york state fairgrounds and galeville around 1145 pm edt. syracuse, lee and kirkville around 1150 pm edt. sullivan around 1155 pm edt. 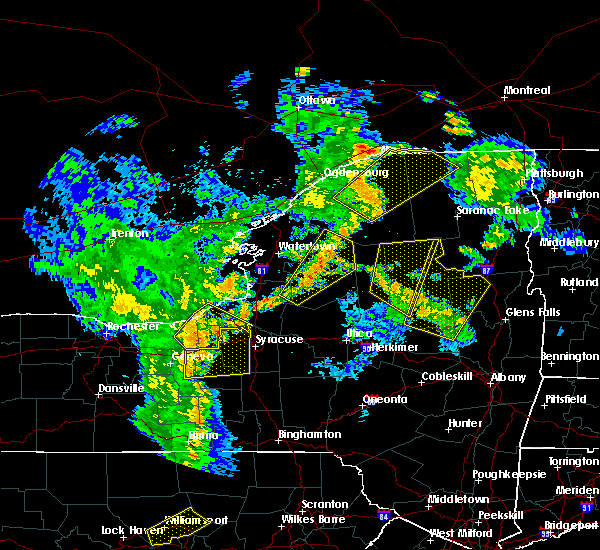 rome, chittenango and canastota around 1200 am edt. lyndon and wampsville around 1205 am edt. Oneida, lenox and manlius around 1210 am edt. 6/12/2015 6:24 PM EDT At 624 pm edt, a severe thunderstorm was located over cascade, or 13 miles south of auburn, moving east at 65 mph (radar indicated). Hazards include 60 mph wind gusts. Expect damage to roofs. siding and trees. this severe thunderstorm will be near, sempronius and kelloggsville around 630 pm edt. 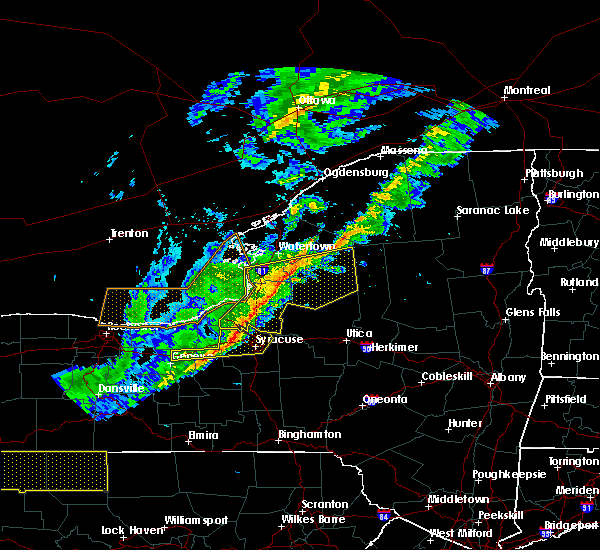 A tornado watch remains in effect until 1100 pm edt for central new york. 6/8/2015 12:31 PM EDT At 1230 pm edt, a severe thunderstorm was located near montezuma, or 9 miles north of seneca falls, moving northeast at 55 mph (radar indicated). Hazards include 60 mph wind gusts. Expect damage to roofs. siding and trees. this severe thunderstorm will be near, jordan around 1240 pm edt. Baldwinsville, lysander and plainville around 1245 pm edt.